Author’s note: The following passage from Summer in the Waiting Room: How Faith, Family, and Friends Saved My Life is the 4th of nine parts that details June 7, 2010, the day that a massive heart attack forever changed my life. Sandra got home and urged me to call the Kaiser advice-line again to schedule an appointment. I got a different nurse on the line, and she asked the same questions. This time, I told the nurse that pain was shooting down my left arm. She suggested that I see a doctor immediately. I insisted that it was extreme anxiety, but I accepted her advice and agreed to take the earliest available appointment. I rationalized that a doctor would quickly diagnose an anxiety or panic attack, prescribe medication, and send me on my way so I could return to all of the critical matters that stood before me. It was close to six o’clock, almost twelve hours after my day started. The nurse scheduled the appointment for 7:30. I called the school district office to explain that I was sick and wouldn’t be at the graduation ceremony. While I dressed, Sandra told the girls that they would have dinner with Tía Shelley and Tío Pancho so she could drive me to the clinic for the appointment. Marisa remembers that I “walked quickly to the car, sat down, and started squirming in my seat.” At this point, the girls weren’t alarmed about anything serious. At Pancho and Shelley’s house she remembers telling them jokingly that I had been so stressed that I was probably having a heart attack. The ride to the Kaiser Santa Clara Medical Center clinic was uneventful. Sandra drove as fast as she could while I continued to writhe, the discomfort on my shoulders and upper chest increased as every minute went by. She dropped me off at the entrance to the clinic and quickly drove away to find a parking space. I labored into the building, took the elevator to the second, floor, and made my way to the doctor’s office where I met Sandra and checked in at 7:26 PM. We sat in the waiting room for just a few minutes when the nurse called me in to see the doctor. A quick check of vital signs weren’t alarming: temperature – normal at 98.6 degrees, blood pressure – 128/61, weight – 208 lbs., heart rate – a little high at 116 beats per minute, but that could have been caused by the rush to the office. Slightly relieved, I was even more convinced that I was having an intense panic attack. The doctor reviewed the vital signs, asked me a few questions about how I felt, and immediately ordered an electrocardiogram (EKG) to determine if there were any irregularities in my heart function. The nurse attached electrodes to my chest, programmed the EKG machine, and watched it whiz and purr as the needle on the printout page rapidly moved in a zigzag motion drawing tiny peaks and valleys on the white computer paper. As soon as the machine stopped whirring, the nurse ripped the computer print-out from the machine and quickly disappeared into the hallway. The doctor came back seconds later to tell us the EKG reading was abnormal and I should proceed to the emergency room for more tests. By the time the doctor finished her diagnosis, the nurse was in the hallway standing behind the wheelchair that was to take me to the hospital emergency room on the other side of the large complex. With a fast gait, she pushed the wheelchair out of the clinic hallway, into the clinic lobby, and out to the main hallway that led to the hospital about a half city block away. The nurse moved swiftly as she fumbled with her cell phone. Sandra offered to push the wheelchair so the nurse could use her phone, when suddenly the gait turned into a trot, and ultimately a jog to the emergency room. Tall ceiling to floor windows formed a breezeway that connected the clinic to the hospital, and I could see out to the cafeteria and parking lot beyond that life was moving at its usual pace while my life appeared to be heading toward crisis. My mind swirled with random thoughts that ranged from doom to confusion to relief. Could I be having a heart attack? Why didn’t the doctor say that? Was she just taking precautions by sending me to the emergency room? Why was Sandra pushing the wheelchair at a jog and why was the nurse excitedly talking on the phone, and to whom? I couldn’t hear what she was saying due to the noise that was filling my head with questions. We got to the elevator in the hospital and went the one floor down to the main lobby and the emergency room. When the elevator doors opened, we raced across the lobby floor straight into the emergency room where I arrived at 7:41 PM. Three doctors wearing white smocks waited for us, and within seconds, I got my answer. It had finally all caught up to me: the genetic predisposition to heart disease, the high-fat diet as a kid, the lifetime of anxiety, the urgency to make up for my college failures, the tireless climb up the corporate ladder, the A-G Initiative, the County budget, the tension with my siblings, my fears about losing yet another election. Combined, they had conspired to create the perfect toxic cocktail that led to a medical disaster. All the while I thought my anxiety was haunting me and intensifying, my blood was thickening and clotting and trying to avoid narrow gaps in arteries lined with plaque caused by genetics and periods of unhealthy living. Author’s note: The following passage from Summer in the Waiting Room: How Faith, Family, and Friends Saved My Life is the third of nine parts that details June 7, 2010, the day that a massive heart attack forever changed my life. Miraculously, I got home safely, stepped out of the car, and listlessly walked up the driveway and walkway that led to the porch. Marisa and Erica were at home because school was out for the summer, so I stopped at the front door to take a deep breath before I walked into the house. I didn’t want the girls to notice the strained look on my face and the uneasiness in my gait. They were in the family room watching television as I walked away from their view to the bedroom. I was sweating and the anxiety was building up inside of me like the volcano my friend metaphorically described. I took off my necktie and suit jacket, and threw myself onto the bed. Marisa figured that a work or political matter was on my mind because she lifted the phone to call a friend and heard my voice on the other line. She later ironically remarked that I seemed so upset that I was probably figuratively “having a heart attack.” In the bedroom, I wasn’t talking business. I was on the phone with the Kaiser Permanente Health Plan advice nurse. Positive that I was having a full-fledged panic attack, I explained to the nurse that I had an anxiety and panic episode nearly six years earlier. I was now experiencing the same symptoms, just a little more intense. The advice nurse asked standard questions about age, weight, medical history. Based on my answers, the nurse said that the symptoms I described sounded like a panic attack and recommended I take a warm shower and rest. Heart attack was the furthest thing from my mind. I was so convinced of my self-diagnosis, I persuaded the nurse as well. If the symptoms persisted, she continued, I should call back immediately. I called Sandra to update her on my conversation with the advice nurse and got ready to get in the shower. Erica told me a couple of years later that she caught me walking between the bedroom and shower to ask if she could go the movies with some friends, and I answered “yeah, sure” in a “grumpy way.” Like Marisa, she too thought I was just stressing over one of the many things on my mind. I started a steamy shower, sat down on the shower floor, and closed my eyes to clear my mind of the multitude of thoughts that raced through it. Once out of the shower, I put on a pair of shorts and a t-shirt, and walked out the sliding door from our bedroom to the patio, my favorite place to relax. The backyard and patio had become a sanctuary for me and Sandra. About five years earlier, Sandra and I designed what we thought was the perfect backyard for our home, a Mexican motif with winding clay-colored sidewalks that lead from a tiled gazebo to a large arbor covered with climbing pink trumpet flowers. A green lawn separates the two structures and a variety of plants, bushes, and flowers grow behind a four-foot retaining wall topped with bull-nose bricks. Three tall pine trees dominate the far corner of the yard and majestically stand over the property. My favorite part of the yard is a small patio behind the arbor covered by a natural canopy made of the pine tree branches and the intertwining of the neighbor’s willow tree and the climbing trumpets that cover the arbor. The only sounds that can be heard from this relaxing quiet spot are birds chirping, the wind going through the pine trees, a neighborhood dog occasionally barking, or a jet departing from San Jose International Airport leaving the valley for parts unknown. Sitting in the small patio behind the arbor helps me relax and keep the troubles of the real world from my thoughts. This time I couldn’t relax, I kept thinking about how anxiety and panic were consuming me. The symptoms weren’t getting any better or any worse. I closed my eyes to take in the soothing sounds of the swaying trees above, but the tightening in my chest, the ever growing heaviness on my shoulders, and the frequent need to catch my breath drowned out everything but the noise of my hectic life reverberating in my head. Author’s note: The following passage from Summer in the Waiting Room: How Faith, Family, and Friends Saved My Life is the second of nine parts that details June 7, 2010, the day that a massive heart attack forever changed my life. After doing more relaxation exercises and deep breathing techniques in the car, I shifted the transmission into drive and rushed to the office realizing that I was already late for my scheduled 11:00 AM meeting with Sylvia Gallegos, the deputy county executive. Sylvia and I had known each other for over 17 years. She was chief of staff to the councilwoman I worked for during the beginning of my career in politics. I called the office from the car to ask the staff to inform Sylvia that I would be in the office by 11:30 AM. It was at this meeting where I was to lay out George’s plan to allocate $2 million from the parks fund to build a soccer complex in his district for community use. We knew there would be opposition to his proposal as the parks fund advocates wanted all of the money to be used for trails and large regional parks, uses that are rarely, if ever, used by the constituents in George’s historically underserved neighborhoods. Sylvia, a smart and seasoned public administrator, could be an ally in reshaping the county’s practice of allocating parks resources to open spaces in affluent areas, so I needed to provide her with a compelling analysis of George’s proposal to secure her support. I hustled into the county administration building through the entrance at 70 West Hedding Street. Suddenly I had to slow down to catch my breath, my mind believing that an anxiety attack was imminent. In reality, my body was feeling the effects of thickening blood pushing through arteries that had been narrowing for most of my life. I finally reached the 10th floor board of supervisors’ offices at noon. Sylvia, wearing a perfectly tailored business suit as usual, waited at the conference table in George’s office when I walked in. I apologized to her for being an hour late. She asked if I was okay, and I responded that I wasn’t feeling very well and immediately proceeded with the business at hand. This was unusual because casual talk about our families and personal matters always prefaced any business we had to discuss. I don’t remember anything that happened during the next several minutes. According to Sylvia, I appeared “distracted and unfocused.” Noting that it was uncharacteristic for me to be unprepared for a meeting and unable to articulate, she repeated concerns about my well-being only to hear me respond that “I didn’t feel right.” I stopped the meeting after about 10 minutes, led her out of George’s office, muttered something to our office manager Marisa Ybarra, and stumbled into my office shutting the door behind me. Marisa, my friend of 25 years, is married to Sam Ybarra, the friend who asked me to help him coach at the parochial school more than 25 years before. I helped Marisa get a job with the previous county supervisor and she stayed on with George after he was elected. She recounted that I had walked out of George’s office with Sylvia, mentioned to her that I had to tie my shoes, walked into my office, and closed the door – which is something I never do. Sitting on my office chair, I bent over to tie my shoes even though the laces weren’t loose or untied. I leaned back in the chair with my hands folded behind my head trying to find the right breathing and relaxation exercise to release the anxiety I thought was taking over me. Meanwhile, the clotting blood gushing through my body told a different story. I emerged from my office and told the team I was sick and going home. Meandering through the narrow walkway that led to the 10th floor lobby and elevators, I followed my own footsteps that took me on my triumphant return to the James Lick High School graduation ceremony 360 days before. This time the walk was different. I didn’t race excitedly through the ground floor breezeway to the parking lot at the west end of the building as I did on June 10, 2009. Rather, I slowly exited the elevator on the ground floor with my hands clasped behind my head trying to compose myself. Twenty steps later, I had to stop to catch my breath. I sat on a wooden bench under the gaze of the large Abraham Lincoln bronze bust in the east wing lobby of the county administration building, loosened my orange and blue necktie, and wiped the sweat off my brow. Off the bench, I ambled sluggishly through the breezeway with my heavy shoulders writhing with the discomfort weighing on my upper chest and throat. There was no doubt in my mind that I was in the full throes of an anxiety and panic attack. I had to stop and sit once more, this time just steps from the west wing entrance to the parking lot. It seemed like an epic journey. When I got to the car, I called Sandra to tell her I was going home because I wasn’t feeling well. The drive was surreal, I felt as though nothing was happening outside of the car. When I was focused back on the road, it seemed like I was driving in slow motion as the other cars on the freeway raced by. Author’s note: The following passage from Summer in the Waiting Room: How Faith, Family, and Friends Saved My Life is the first of nine parts that details June 7, 2010, the day that a massive heart attack forever changed my life. On Monday morning, June 7th, my weekly routine got off to its usual start with countless issues racing through my mind, a churn in my stomach, and heaviness in my shoulders. After taking Erica to school, I drove to the gym to meet Sandra and Jerry hoping a good workout would release the stress that seemed to be taking over my body. When I got to the gym, Sandra was already there warming up on the treadmill. I began a brisk walk, then a light jog, on the machine next to her as we talked about our respective schedules for the day. Her day would be filled with the usual steady demands on her time as a school principal being pulled in numerous directions like a ball of Silly Putty – parents, teachers, students, and district administrators all seeking a few minutes with her. My schedule was a typical day for a political chief of staff and school board president: staff meeting at 10:00 AM, meeting with the deputy county executive at 11:00 AM, work through lunch returning e-mails and phone calls, team meeting at 1:00 PM with George to prepare for the next day’s county board meeting, managing follow-up action items from the George meeting, and finally, presiding over the 6:00 PM graduation ceremonies at one of the district high schools I represented on the board. Once Sandra and I were done warming up and stretching, we joined Jerry for what was sure to be an hour of vigorous strength and aerobic training. We started off with sets of squats, lunges, and burpees, an intense aerobic workout that includes squats, push-ups, and jumping all in one motion. At this point, sweat usually starts pouring over me and the stress and tension in my body begins to subside. My sweat glands responded as usual, but the tension, the heavy shoulders, the churn, and pressure on my throat and upper chest only intensified. Between exercise sets, I used the breathing techniques I learned in the anxiety classes hoping to relieve the pressure that was slowly building up in my body. The tension in my shoulders, the upset stomach, the discomfort around my neck and throat, the difficulty catching my breath continued through sets of bench presses, legs presses, and dumbbell exercises. Sandra and Jerry kept asking if I was okay and I responded that it was stress and my anxiety acting up, and I just needed to work through it. Finally, while doing a set of push-ups with a medicine ball on my back, Sandra, with a worried look on her face, demanded that I stop. After a few minutes needed to regain my composure on a gym bench, I went into the locker room to shower and dress for the day. The hot water from the steamy shower rained over my head and body. My mind raced thinking about all of the challenges before me: the county and school board budgets, the fraying relationship with one of my siblings, the coming tsunami of political rhetoric from an opponent with an axe to grind during the upcoming fall election. The stream blanketed my body trying to soothe the pressure while the thoughts in my mind swirled. But, my anxious body responded the same way it did after my mom and Patty died seven years before, just more intensely. After toweling off, I had to sit and catch my breath as I continued with the anxiety breathing exercises. Once I calmed down, I put on my trousers, buttoned my shirt, tied the necktie around the shirt’s collar, and sat in front of a row of metal lockers to tie my shoes. Again, I stopped to relieve the anxiety by taking deep breaths through the nose and slowly exhaling through the mouth in a steady rhythm. I left the locker room and wound my way through the gym floor through the lobby and out to the parking lot as the anxious feelings intensified and my mind swirled with ever-changing thoughts. In my car, I sat trying to relax, trying to catch my breath, trying to mentally prepare for the long day ahead. I don’t know how long I sat in the car, but I was startled by Sandra pulling into the parking space next to my car to ask if I was okay. I mumbled that I was fine, started the car, and began driving to work. Once I started driving, I began to feel better and remembered that I wanted to buy a tie to match the school colors of the graduation I was scheduled to preside over later in the evening. I stopped at a Kohl’s department store and briskly walked to the men’s department while reading and returning e-mails on my Blackberry. The churn in my stomach intensified, my shoulders grew heavier, and I had to stop to catch my breath a few times before finding the necktie section. I quickly picked out an orange and blue striped tie that matched the school colors and the navy blue suit I wore. I dragged myself to the cashier and labored my way to the car trying to fight back the anxiety I thought was taking over my mind. Once in my car, I again sat for a while to compose myself not knowing that the blood gurgling though my veins and arteries was thickening, clotting, and preparing for battle. The next day, Sunday, June 6th, was exactly one week since I lost my breath during the unfinished one-one one basketball game with Andres at the barbecue at Kim and Miguel’s house. As president of the school board, the week was an unusually busy one with graduation ceremonies, academic award nights, and after-school sports banquets. I wasn’t getting much sleep. Stress and anxiety dominated my mind since waking up on Sunday morning. The next week would be critical in George’s effort to secure parks funding and my effort to keep after-school sports intact for another year, not to mention the ongoing A-G debate. The tension from my parents’ estate intensified. I hung up on one of my brothers in anger and frustration. On top of all that, a disgruntled former district administrator, the most viable opponent in my fall election, had aligned himself over the weekend with the teacher’s union that resisted the A-G Initiative. My mind was swirling, my skin was warm and clammy, my upper chest and throat were uncomfortable, and my shoulders were heavy. The Peralta family gathered at a Dave & Buster’s restaurant to celebrate Andres’ birthday. With its large room of carnival and arcade games, Dave & Buster’s was a perfect place to have a kid’s party and to escape from my racing brain. At the arcade, Pancho challenged me to a free throw contest to see who could make the most baskets in one minute. For sure this would take my mind off of the multitude of thoughts racing through it. When the timer started and the arcade machine released the basketballs, Pancho and I began a frantic pace to make as many free throws as possible in the short time span. When time ran out, I emerged victorious, but had a hard time catching my breath. The pressure in my throat was more intense and my shoulders were so heavy that I sat on a stool next to a pinball machine hunched over trying to regain composure. When I caught my breath, I worked on the breathing and relaxation exercises I had learned to manage stress and anxiety. I felt better the rest of the day even though the challenges that lied ahead at work, and in my political and personal life, continued to monopolize my thoughts. I believed that the symptoms causing my discomfort were due to an impending anxiety attack and I was using the techniques to manage it. However, something entirely different was happening inside my body. The fatty and greasy meals my mom made when I was a boy transitioned into the typical American twenty-something fast-food diet. Add a genetic pre-disposition to high cholesterol and heart disease, and the result is plaque build-up in the arteries that began at a young age. By my early 30s, due to my parents’ pre-mature heart attacks, I began exercising regularly and trying to eat as healthy as possible, although I was inconsistent at managing a healthy diet. Nonetheless, I ate better as an adult than as a kid. At 46 years old, my arteries surely were hardening due to genetics and years of a high fat diet. The intense workouts were keeping my heart pumping and blood flowing, so thoughts of a heart attack were far from my mind. There was another interesting phenomenon that could have been happening inside of me. The constant state of high stress and my tendency for anxiety were causing the hormones and chemicals in my body to keep me in a perpetual state of “fight or flight.” This was exhibited by the steady churning in my stomach, frequent jolts of acute alertness, and the subsequent need to catch my breath. For decades, researchers have studied the correlation between stress and heart disease and the conclusions have been consistent – stress leads to a poor diet, lack of sleep and exercise, and high blood pressure. 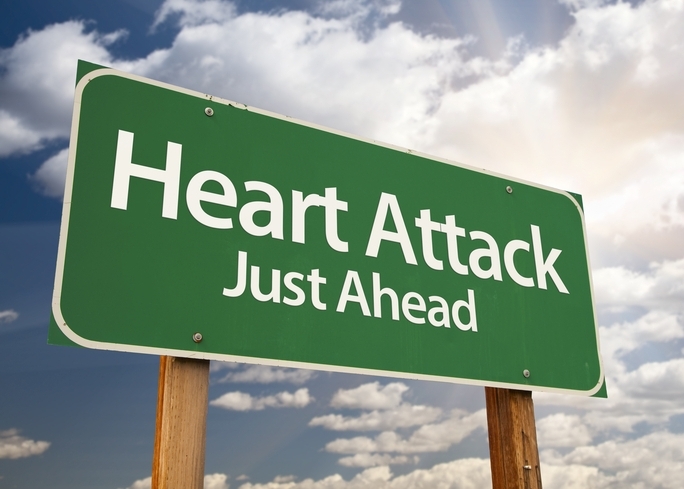 Recent research has also made a connection with high levels of steady stress and a sudden heart attack. According to these studies, the chemical reaction in the body that produces the “fight or flight” sensation causes the blood to start thickening and clotting in preparation for a blow to the body that could result in an injury inflicted during a physical altercation. In other words, the body is getting ready for a fight and protects itself from potential excessive bleeding. Since my return to college and subsequent entrance into the world of career-building and redemption, my body had been in a perpetual state of alertness. During the first six months of 2010, that high level of stress my body had experienced for more than two decades had intensified many times over. For sure the blood that flowed through my body had thickened and clotted with every crisis I confronted as it squeezed through the narrow openings of plaque-filled arteries.